Without explicitly saying it, Alan Hansen made it clear of Match of the Day that he thinks that the losing manager of Tuesday’s bottom-of-the-table clash between Blackburn and Bolton will be lucky to hang onto their job afterwards. The pressure on both Steve Kean and Owen Coyle scaled new heights on Saturday after their clubs’ predicaments worsened with defeats to fellow strugglers West Brom and Fulham. And with the fixture list throwing them together in front of the TV cameras on Tuesday, whichever side ends up pointless – and a stalemate appears unlikely given Bolton’s inability to draw – will be bottom of the Premier League at Christmas. That’s a position from which just one team in the division’s 19-year history has survived, West Brom in 2004-05, and may force the thus far patient boardrooms into action during the supposed season of goodwill. Blackburn and Kean are actually a point better off and, having only once in his year-long tenure lost three in a row, are rated favourites at 11/10, but of the two tacticians he more unpopular, with Rovers fans unimpressed by a 19% win rate. 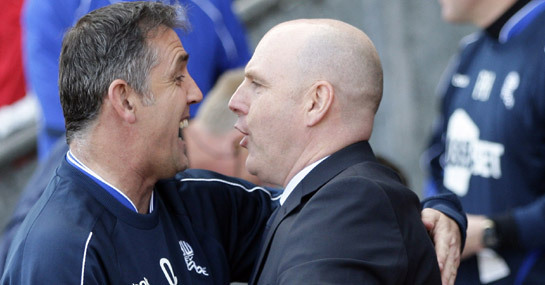 Coyle can at least point to a decent – if overrated – first 18 months in the dugout at the Reebok in which they reached the FA Cup semi-finals and briefly flirted with the top six last term. However, their slump since a 5-0 Wembley humbling by Stoke in April has been startling and a quite remarkable 18 of their last 21 league games have been lost, forcing Bolton supporters to reassess the progress that has been made. Another worrying sign was Coyle’s eagerness to blame the players after their latest setback at Fulham, despite claiming to accept responsibility for the situation. Like Kean, he retains confidence that he can stop the rot, pointing to a favourable run of matches on the horizon, yet defeat at Ewood Park – where they are 2/1 to triumph – may deny him a chance to fix things.